Fall has arrived, the temperatures are dropping and the leaves are changing colors. Now is the time to ensure your outside enclosure is winter proof. An outside space needs to have 4 walls and a roof. It needs to provide protection from the elements and be able to not only keep your pig safe, but also warm. If you use a dog house or custom pig house, thats great. Some have barns, some pigs only go outside to potty and go back in the house. Some pigs live outside only and those pig owners have to take measures to make sure their pig(s) have a warm place to go. Straw makes a great insulator, so does hay. 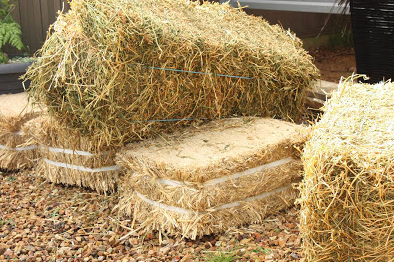 The best heat producer for horses or pigs is hay. It produces heat as it is digested. But, pigs also like to eat hay, so you may lose some of your insulator as time goes on. Also, hay does mold and a pig eating moldy hay can result in health concerns. So, regardless of what you decide to use, please check it often for mold/rot and remove any affected portions and replace with fresh hay/straw. Blankets work for some pigs. A nice box filled with straw and blankets big enough for them to cuddle up together in. Sometimes people like to use heat lamps when it gets really cold. Just be careful to be sure they are high enough to avoid being touched and have a wire on them to hold the bulb up because there have been some tragic events from heat sources causing barn fires. Sometimes even a regular light bulb will add a touch of warmth. Covering windows and doors with blankets or rugs can help. (Including the entrance door) A DIY way is to find a heavier plastic or even carpet and tack it up on the outside of the enclosure so there is a barrier against the wind. For additional outside housing ideas, click here to view that page. 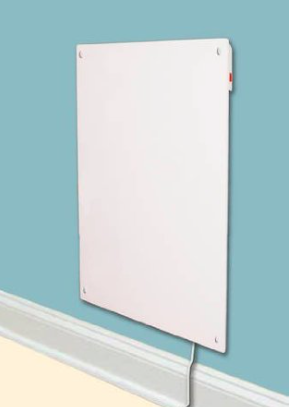 These are mountable wall heaters that can be found on Amazon.com. ​http://www.amazon.com/Amaze-Heater-previously-Cozy-Heater-Mounted-Electric or ​http://www.amazon.com/gp/product/B005DKN20W. What do others do during the winter months for their pigs? I recently asked other pig parents how they keep their pigs warm during the winter months and this was some of their responses. Carrie Buko says: Straw is what you need for insulating and bedding. Straw stays dry longer and is much easier to clean up. Like someone else said, but I would put it on the inside of the shed. Stack bales of straw about 3 bales high in a square area for the bed. Then a canvas tarp over it to contain their body heat. Break open a bale of straw for them to lay on. That way they will have an area to eat inside of the shed too. Piggies appreciate having some good second cut hay to eat. But put that in the eating area. The main thing is to keep them dry and out of the wind. Estee Creel added: No drafts and enough straw (not hay). Enough that they can bury themselves and you can not see them. They matt it down pretty fast so you have to keep fluffing mid week and add more by end of week. They eat some too. We add fleece blankets as well. We have a fully heated house and none heated with straw and all four choose straw house, yup waisted $1000 to heat one for them. I live in CT. We have COLD winters and lotsa snow here. Jake Davolio says: When we first started we used small dog houses with lots of straw. 19 below zero and they were all snuggled up under the hay and toasty warm. We have since built a small 12x24 barn with individual bunks with personal doors. We fill the boxes with hay and they are toasty warm. If you heat the barn, it will be difficult for them to regulate to the extreme cold when they have to go outside. 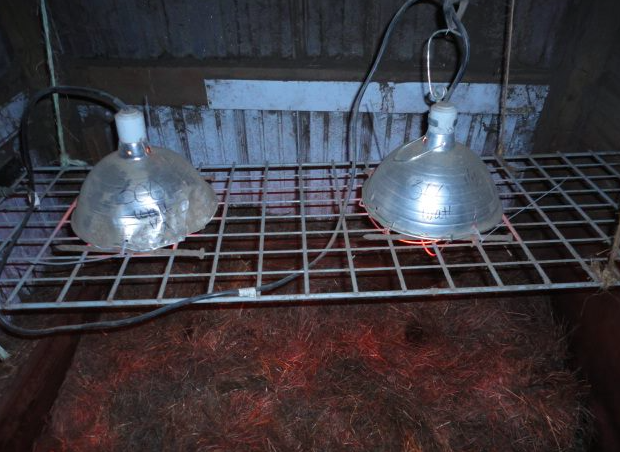 We keep our chickens in the barn as well and they get a simple 60 watt light bulb. Tina Lufkin shared her method: All of mine that are in the barn I cover with blankets once they are settled, then five of the small pigs, snuggle together in a small house I built for them , the roof is low and I fill it with straw and cover the whole house with heavy tarps, they stay very warm that way!! Nicole Laskos stated: If you use a heater in the winter PLEASE do not use a heat lamp of any kind. There are so many ways they malfunction. Every winter it breaks my heart to hear of all the barns that burn to the ground from a heat lamp. Please consider a flat panel heater (there are many different ones on Amazon) or a Sweeter Heater. 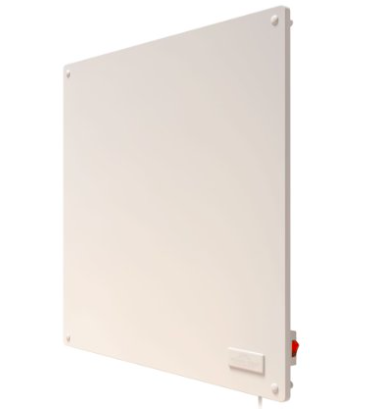 Sweeter Heaters are made for animal use and are much safer and also much more energy efficient. I have one and it works great. I also have a flat panel heater, also works great. http://sweeterheater.com/. Someone asked about the exposed cord and her response: Tuck it away but mine aren't chewers. The sweeter heater hangs from the ceiling so the cord can be directed upward. Either way, make sure when you plug in anything around animals it goes into a grounded outlet. That way it will automatically turn off rather than electrocute them if chewed. I personally know of one pig and one horse who were shocked and killed by chewing on a non grounded cord. Christy Lutterbie says: Three of mine are outside in the barn. Lots of straw and blankets that we pick up cheap from goodwill. We also hang a heating light above the pen that we bought from tractor supply. There are lots of opinions about heating lamps, but it keeps them warm and we are extra careful with where it hangs and how close it is to the pigs and straw. We also purchased a mat that we bought at tractor supply that they use for horses. It's a huge rubber mat that keeps the pig off the barn floor. We pile the blankets and straw on top of it. It's also cut a way that allows for drainage in the event piggie has an accident. The most important thing you can do to ensure your pig is nice and toasty in the winter months is provide a shelter with a floor off the ground and plenty of insulation like fleece blankets or straw/hay. Again, be sure to check the hay often for mold because it does mold when it gets moist. Whilst ruminants are more susceptible to acorn poisoning, outdoor pigs may be affected occasionally. 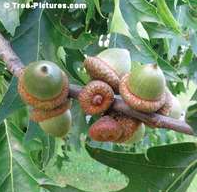 Young oak leaves or green acorns are the major sources and signs are seen two to three days after ingestion. These include abdominal pain and constipation followed by haemorrhagic diarrhea. The kidneys may also be affected. Again, My pig Buttercup was diagnosed with acorn toxicity just last year. Her urine was brown in color and according to the blood tests, her liver enzymes were elevated. She was removed from the acorn source and when her urine was clear again (about 2 weeks after the acorns were removed), her blood was drawn again and lab results revealed a downward trend and were on the way to returning back to normal. It's a lot easier to simply pick up the acorns than nurse a sick pig back to health. Some say acorns are not toxic to pigs, I disagree. Not all pigs are affected by eating the acorns, while other pigs are. This may have something to do with the genetic makeup, how the body processes foods and less to do with the actual acorns, but its not worth the risk to me. I have to vacuum the acorns up everyday with a yard vacuum or riding lawnmower with the bagging attachment and that has to be done several times a day to manage the amount of acorns in my yard. Large amounts of acorns eaten have the potential to cause issues with pigs. Avoid the areas that have a lot of acorns, use fencing to separate your pig from areas that have oak trees that produce a lot of acorns. Although some say acorns aren't problematic, is it worth the risk? Acorn Calf SyndromeThe acorn calf syndrome is not related to oak poisoning attributed to gallotannins but is encountered in calves born to cows on a low plain of nutrition and which have consumed quantities of acorns. Acorn calves are born with laxity of the joints, shortened legs (dwarfism), deformed hooves, and either a domed skull or long narrow head. Compared to normal calves, the acorn calves are stunted and grow poorly. The acorn calf syndrome has also been reported in cows that graze heavily on lupine during mid pregnancy. The toxic principal responsible for this congenital syndrome has not been determined. Protein malnutrition and the presence of a teratogen may be involved in the development of the acorn calf syndrome. Some place the water dishes in areas that are temperature controlled or frequently change the water to ensure its not frozen, either way works as long as fresh drinking water is available. With it being winter or even fall, the air gets drier and so does the skin. Drier skin means more scratching. More scratching means more areas that are a potential gateway for infections. Check your pig daily, look for new areas of concern. Look for open areas, sores, scratches and red areas, tender to the touch spots or areas warm/hot to the touch or any areas that are swollen. Check your pigs temperature and be sure you have a baseline so if your pig does become ill, you know what is normal versus abnormal for your pigs baseline. Keep your pig hydrated and moisturize the skin with coconut oil or perfume free lotions. (always test an area before rubbing all over pig to be sure there is no allergic reaction or sensitivity to a new product) Pigs don't have "fur" and although they do have hair, its not sufficient to keep them warm like a furred animal. This is the cold, flu and pneumonia season, there is a pneumonia vaccine, however, it does not cover all the different strains of the disease, so it may reduce the risk, but doesn't eliminate the possibility. Signs of pneumonia are lethargy, runny nose, coughing, inappetence, changes in behavior. (click here to read more about pneumonia) It is also a good time to be sure any biannual vaccinations are given. The change of seasons is a good time to do parasite control as well. (click here to go to the parasite control page) Pigs should be treated for parasites at least every 6 months, some treat more often under the direction of their vet. Hay is a very GOOD idea, as it helps satisfy their inate need to forage. It adds quality long stem fiber to the diet to aid in digestion. It gives them a sense of fullness with low calories. It's very good for them, however, there are better types of hay than others. It's been said that rich hay such as alfalfa can cause stones. When pigs develop an interruption in the urinary habits, this can lead to even further complications like bladder rupture or sludge to build up in the bladder requiring surgery to correct. Alfalfa hay has been known to cause complications within the urinary system, it has the right combination of protein, calcium, phosphorus to predispose for the formation of crystals in the urine. Alfalfa is great for animals that are hard keepers or need to gain weight. It can also disrupt the calcium/phosphorus ratios which should be carefully calibrated in her feed. They sell Timothy hay for bunnies in bags at pet stores which is a better option for pigs. Timothy and grass hay is the best choice for your pig to munch on, but not gain excessive weight. To summarize: Hay is ok, but will likely be eaten, hay also molds, so you will need to check it frequently for any signs of mold and replace since piggies like to nibble on it. Straw is a great insulator and cheaper to buy and will keep your pig warm. Avoid alfalfa hay - It has a high protein content and large amount of calcium - it may lead to urinary tract infections, bladder stones and obesity. Any type of grass hay (timothy, orchard, mixed) should be ok.
Winter clothes for your pigs? Check out our recommended pig product page with links to stores that make pig clothes by clicking here. The outfit pictured at the top of the page was made by Dawn Blackburn and her information is on the recommended pig clothes section. Jan Monasmith shared her baby outside area. Jennifer Anderson shows off her piggy's coat. 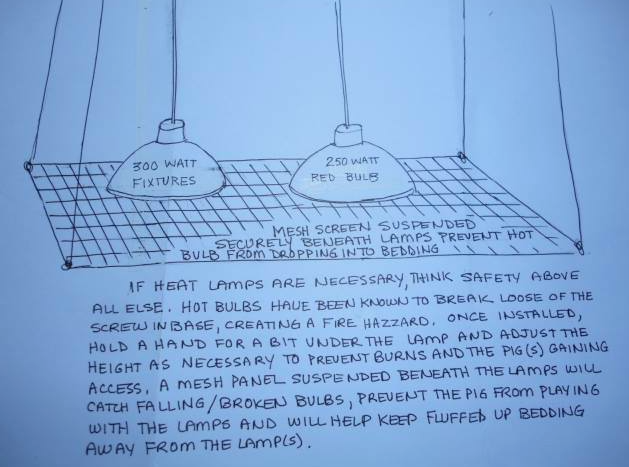 Thank you to Dawn Camp for sharing her lighting technique to keep the piggies warm and safe from being burned. Fire is your pigs worst enemy during the winter months. Do NOT use a space heater or anything that can be knocked over, pigs love the heat and will crowd the area tipping these kinds of devices over which can spark and start a fire. There have been some tragic situations/barn fires where the pigs weren't able to escape. Use something that will not cause any problems or at least not something we know causes fires and isn't effective. Some are fortunate enough to have heated barns, but for those who have just one or a few outside pigs, we hope that we have provided you with some wintertime solutions to help you keep your pigs safe from the harsh elements during the winter months. Rescued by Jennifer at Curly Tail Farm Rescue. Any skin with blood flow can get frostbite. When you are out in the cold, sometimes you notice your hands turning red (once inside, you see your feet are also red). The redness that you're seeing is called frost nip and that's an early sign of frostbite. Frostbite can happen in as little as 5 minutes in the right conditions and it is literally the skin freezing. The level of severity depends on how many layers of tissue it penetrates but is staged in 3 categories. The first stage, it turns white or light yellow, it may itch real bad or even sting. The second stage, it can turn hard and/or shiny and when the skin thaws, it can form blisters. In the advanced third stage, the skin will harden and turn blue or black and it's ice cold even to someone elses touch. Once it has penetrated that deep into the tissue, the person (or pig in this case) may not even know anything is wrong because the area is numb, but in the advanced stages, there is no recovery from those areas that have frostbite. As with any part of the body that has restricted or no blood flow, the skin dies and becomes necrotic. The necrotic tissue will slough off as it dies. Miracle the pig was rescued by Jennifer at Curly Tails Pig Rescue in 2014. Miracle had frostbite from being neglected and not having a warm place to go during the harsh winter she was forced to live through. She had multiple issues, but her missing back foot/hoof was the upmost concern. She was in bad shape, i remember the first pictures I saw of her and that leg. She is one of the lucky pigs, the pig community rallied and raised money for vet care and a new pig leg. She is now thriving in her home, but taught everyone that pigs are not only tough and can survive the worst of conditions, but they can still be loving pets when properly cared for. Be sure your pig has a place off the ground to go. Placing hay or straw on the ground does provide some warmth, but the ground is still cold and depending on which you're using, will also absorb the moisture from the ground and can mold or rot. Check your pigs extremities for any signs of poor circulation, be sure the hooves don't have any symptoms of infection, if they do, treat accordingly. Frostbite is a real possibility for any animal that doesn't have shelter from the winter elements and this is an important story to share with the pig community so everyone is reminded of the possibilities. Below is a slideshow of Miracles progress from the day she was rescued until now. (Oct 2015) You can follow her story by joining Miracles Journey group on Facebook by clicking here. What about the winter ice? I wanted to be sure my pigs hooves were protected because we had an unusually snowy winter near Virginia Beach Va in 2014, so I ordered some snow boots for my pig. That didn't go over well with her. She is very willing to let me put clothes on her, but boots? Not so much. Mine actually refused to open her eyes, much less try to stand with them on her feet. I would try infant socks on the hoof before going out and spending substantial money on shoes/boots for your pig. Their hooves are pretty tough, granted, they shouldn't have to stand in the snow for long periods of time, but walking through the snow will not hurt them. My pig refuses to go outside unless I shovel a path for her. Be keep in mind, if you are removing snow, there still could be ice on the surface, like a deck or patio, so be sure to check for that as well. Pigs have a difficult time keeping traction on slippery surfaces and can sprain, strain muscles/ligaments/tendons or fracture the bones very easily by slipping. Do NOT use salt to de-ice, your pig may eat this and that can lead to salt poisoning. You can use saw dust, sand or dirt to cover those areas, some farmers use a product called Sure Foot for the ice. Some suggest a pet safe ice melter (but most of these are still forms of salt, so I would avoid them since there are so many other options), others suggest carpet runners they keep by their back doors for this purpose. Others use cat litter to help with de-icing. Vinegar and water also seem to be a popular solution to ice. Be extra careful when walking your pig near frozen areas. Potbellies can slip and be seriously injured. 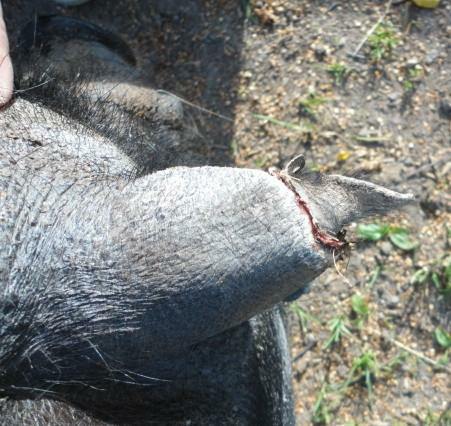 Fractures and sprains can be catastrophic because pigs typically don't want to bear weight on the affected or injured limb. This leads to a plethora of complications. 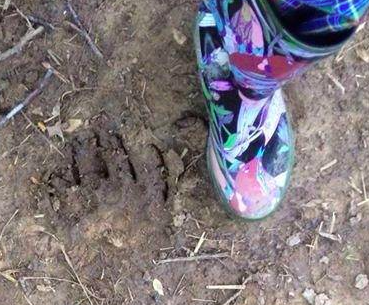 This is my foot/boot next to the bear claw mark left in the dirt. This was a HUGE bear. Last year, a pig rescue in Virginia suffered a great loss when one of their pigs was killed by a big bear. There was an acorn crop failure the previous year, trying to find food in the winter can prove to be difficult. 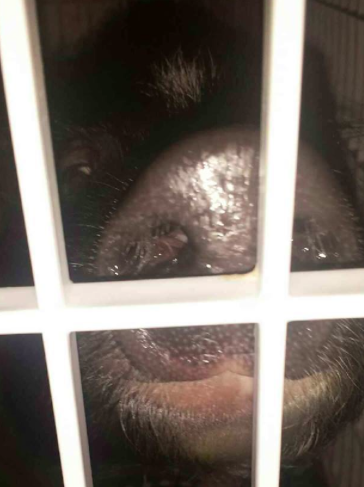 The bear woke up hungry and this unfortunate pig at the rescue was an easy target. (so he thought) The bear was a menace for years and wasn't scared of people, he broke into houses, went inside and opened up refrigerators. Eventually, that particular bear was killed in another area of their town, but he did come back several times to the same spot and even attempted to get a second pig who thankfully suffered only minor injuries. This rescue (Rangers Refuge at Gallastar) has more than 100 pigs, some are special needs, some are elder pigs but all have a forever home at her house. They also have rescued several other species of animals, some of those are also special needs. There was a team of volunteers who literally guarded that rescue overnight and electric fencing was installed around the perimeter of the entire property over several months. A pasture was completely shut down and several pigs witness the whole ordeal, they'll never be the same. Heartbroken and terrified all the time. Thankfully, due to the pig community as a whole, enough money was raised for ALL the pigs to have a safe structure with doors that could be closed and even locked to keep them safe. It was ALOT of work, ALOT of blood, sweat and tears, but finally all the pigs are safe from predators. You can follow Rangers Refuge by clicking here to see more of what they do to save pigs everyday. Have you ever seen a coyote? How about a bear? These types of predators ARE all over the place. Just because you live in the city doesn't mean that a wild animal can't wander into your backyard. This would be extreme, of course, but it can happen. Pay attention, watch the news. I have had a bear in my yard before, its not unusual to see them running across the road in the area I live in. A pig basking in the sun could be an easy meal for a bear thats starving. Im not trying to scare anyone, but just be aware that predators, especially ones that are hungry, can attack a prey animal....this is why keeping your pig secure is so important. Keeping your pigs behind a fence, privacy fence, or electric fencing in addition to chain link or hog panels would be best. (or some other type of deterrent for animals to get inside your secured yard) This is an unlikely scenario, but something you should keep in the back of your mind and prepare as best as you can. Thanksgiving is the next big holiday. Friends and family may come by your house, you may be cooking a grand meal to feed everyone. What happens if your pig doesn't like visitors? Start working with your pig NOW to socialize and teach him/her manners. Don't allow your pig to dictate who can come over your house. The easiest thing to do would be to put your pig away when guests come over, but if your home is anything like mine, it seems like there is a revolving door and placing my pig in another room is not an option. Keep in mind, this is also your pigs home and others need to be respectful of that. Your pig will only act the way you trained them to act, or or be a jerk because of the lack of training. You HAVE to train your pig if you ever plan to have other people around them. An untrained, disrespectful pig is no fun to be around. So teach your pig manners and respect so your pig can enjoy the company of others and your guests can enjoy the company of your pig as well. Not to mention, most people are fascinated to see a pet pig and would enjoy seeing, petting and learning about having a pig as a pet. Just remind them human food isn't good for pigs and ask them kindly NOT to give your pet pig any table food or scraps. Christmas soon follows and again, visitors usually come and go, so the same theory about manners applies here. Be sure to work with your pig on social skills. Teach your pig respect and manners and boundaries. The other problem during the Christmas season is the tree and gifts. 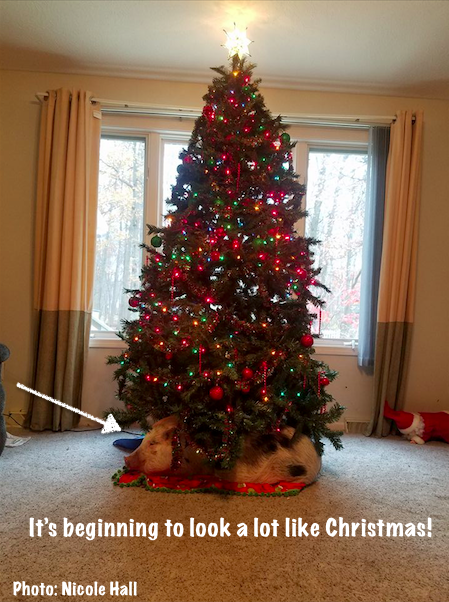 My pig thought the ornaments on the tree were real. (Candy shaped ornaments) She would not leave them alone forcing me to eventually move those particular ornaments up higher on the tree. The lights seem to draw their attention as well, so be be sure your pig isn't trying to nibble on the cords for the tree lights. Gifts sitting on the floor are an easy target for your pig. My pig liked to smell each one and if there was anything scented inside the package, she was all over it. Presents would be found all over the house, but mostly in her area of the house. Eventually, I used a baby gate and put it up around the tree to avoid any further investigating by my pig. I will warn you, pigs are fascinated by wrapping paper, so if you're attempting to wrap gifts in the same area your pig is in, you will spend just as much time moving the pig from on top of the wrapping paper as you do actually wrapping gifts. Some people like to use candles with various scents to fill the house with the Christmas spirit, your pig loves this smells too and doesn't realize its wax. Make sure candles are put out of reach of your pig, they will take a bite out of them, obviously if its lit, this can be a terrible situation. Holly, mistletoe and poinsettia plants are among several poisonous plants that might tempt your pig. You should make sure they are kept in places your pig cannot reach. The holidays are not the best time to be introducing a pet into your family. A new pig requires extra attention and a stable environment, which the holiday season doesn’t permit. Also, a pet pig is not a toy or gift that can be returned. Pay special attention to the lights and cords around your christmas tree, pigs are known to chew on cords. This year in particular, the news is warning pet owners to be on the lookout for ticks in Christmas trees. Temperatures have been on the mild side and not cold enough for a sustained period of time in order to take care of the dreaded summertime ticks. Real trees can house mites, lice, ticks, moths and stink bugs, among other insects that hibernate for the winter but wake up from the warmth of your living room. http://www.wsbtv.com/news/lifestyles/holiday/watch-ticks-xmas-tree-year-health-officials-warn. Please remind guests who may come over with pets of their own, that pigs and dogs are NOT a good idea and dogs are known to attack pigs. Please do NOT leave a pig and dog unsupervised for ANY amount of time, especially not a "stranger" dog. Click here to read more about pigs and dogs, a dangerous combination. If Holly is ingested? Common signs seen include vomiting, diarrhea, anorexia, lip-smacking and head-shaking. Mechanical injury to the oral mucosa can occur from the leaves and foreign body obstruction may occur if a very large amount of the leaves are ingested. Gifts are a surprising source of toxicities during the holidays. If you are going to wrap any food, pet treats, or pet or toddler toys, keep the items in a safe place and well out of your pet’s reach until they are ready to be opened. Pigs have a keen sense of smell and will often unwrap presents early and eat all of the contents. Tinsel on trees is a tradition is a lot of homes. The problem with this is tinsel is shiny and intriguing to pigs, so they may try to eat it. Consuming enough of it can caused intestinal obstructions. Ornaments can be fragile and break into a million pieces very easily. If your pig isn't scared away when this happens, or tries to eat them as they are, these pieces of glass can easily cause a lot of damage when swallowed, not only to the esophagus, but also the stomach and intestines as t passes through the system. Some snow globes contain ethylene glycol, a highly toxic substance to all pets. If a snow globe is broken, either by a person or a pet, the sweet smell can attract a pet to lick it up, leading to a potentially fatal intoxication. Snow globes should be kept out of reach of pets. Pets are often not shy about taking food that is left sitting out on counters or tables. Pets should be kept away from food preparation areas or places where food will be left out. A few of the more concerning common food exposures during the holidays are sodium rich foods and alcohol for pet pigs. But we all know pigs will find holiday food and flip over tables and chairs to get to it. They don't tend to stop eating until they've completely engorged themselves with savory food meant for your human family. ​Don't forget about the trash. Pigs will run to the trashcan because they know (and can smell) yummy things they wish they could have sitting in the trash. They will knock the trashcan over and help themselves to whatever is in there that appeals to them. There are often a large number of visitors during the holiday season, and pets often get into medications that friends or family have brought with them. These exposures can be prevented with a little advance planning. People who are not used to having pets in the house can often be unaware of how curious they can be. Pets will often investigate suitcases and can get into pill vials or weekly pill minders. It is safer to have the visitors put their medication in a closed cabinet that is not accessible to pets. Be sure that when they take their medications that they do so behind a closed door, such as the bathroom, so that a dropped pill can be found before the pet has a chance to eat it. A prewritten list of the names, milligram strength, and number of pills that visitors have brought is very useful in an emergency situation as well. Tell your guests that your pig is a curious pet and will rummage through their belongings if the door isn't shut. Keeping any potential toxic agents out of their reach is best. FYI..pigs can unzip luggage. Ice melt, homemade play dough, and salt-dough ornaments (even when dry) can all be a tempting salty treat for pets, but can cause life-threatening imbalances in the electrolytes. Pet owners should, of course, contact their local veterinary professional. This is especially important for pig owners because pigs have a delicate sensitivity to sodium when fresh water isn't available. If your pig does partake in eating some of these things, do NOT allow your pig to drink massive amounts of water, hydration needs to be done slowly, over a longer period of time to avoid the serious neurological damage, We recommend you get your pig to the vet IMMEDIATELY after exposure or call one of the poison help lines to help you determine what is best for your pig. New Years eve is next. One word. Fireworks. UGH! Loud noises can scare pigs, make sure your pig is safe and secure. Midnight is the usual time these fireworks are lit, so be sure you're prepared in case your pig gets scared. Dippity pig syndrome can occur as a result of external stress like this. (click here to find out about dippity pig syndrome) Alcohol is usually a part of NYE celebrations, so be cautious about leaving open alcohol containers around your pig, they will drink alcohol and pigs can get alcohol poisoning plus, they can be mean drunks. Q: What about indoor pigs that have an outdoor pen for rooting and outdoor time. Our girl is an indoor pig that goes out for a few hours here and there throughout the day for rooting and outside time. I'm trying to figure out what to do for her during the winter. Do you let them out for rooting and outside time during the winter and if so, what do you do to make sure they are warm while rooting outside? Or do they stay inside the whole time except for going to the bathroom? A: Mine is also an indoor pig, I let her out to potty in the winter and if she chooses to stay outside, I have little outside house full of straw. Usually she will potty and then go into her outside house and go in and out of there, but I make her come back in at night to sleep. If she were to come back up to the door to come in the house, I would let her back in though. I do make her stay out on the milder winter days. (Like 40-50 degrees) but when it's freezing outside and she wants to come in, she just goes out to potty. Lots of pigs live outdoors all the time, so as long as they have a structure outside with an insulator like straw to bed down in and get warm, they should be ok outside. Letting your pig stay outside for small amounts of time will not hurt your pig. The key is acclimating them to the new season. If your pig isn’t shivering or nudging the door to come back in, let your pig stay out for a bit and allow his/her body to get used to the colder temps. Do NOT make your pig stay outside with no shelter and no way to keep warm. If they will only be outside for a few minutes, making them stay out is acceptable. However, if you plan to be gone for a few hours and your pig has no choice but to lay in the snow or on the cold ground, that is NOT ok and you should be ashamed of yourself. Get a 10.00 bale of straw so your pig can at the very least try to keep warm. Obviously a smaller pig with little to no body fat will not adapt to colder temps as easy as a larger pig with plenty of adipose tissue. Each pig metabolizes at a different rate, therefore some pigs are perfectly fine with sub-zero temps while others just can’t be outside for long. Watch your pig to determine when it is enough. If your pig is a diva like mine, she refuses to walk on the snow. Shovel a path for your pig. 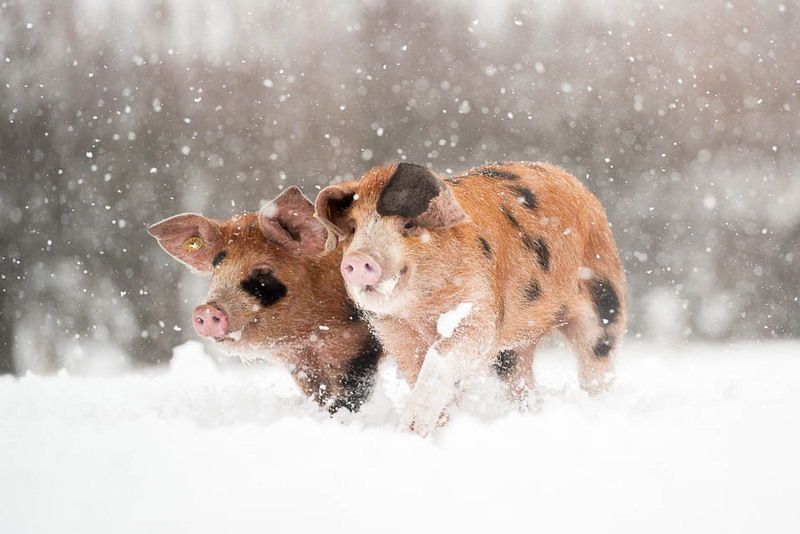 Ice is a danger to larger pigs because they cannot get any traction and can easily slip and fall resulting in muscle strains or tears and even sometimes fractures. Pick a spot that isn’t in the elements, perhaps beside the house under the roof overhang. Build a ramp for those slippery stairs so your pig doesn’t have the fear of falling in addition to the threat of slipping and falling down the stairs. Use rubber or non-slip gripping material on the surfaces outside that get iced over so there is less of a chance of your pig having an injury. Shovel a patch of grass/dirt and use a large litter box. There are recommended litters that are safe for pigs, just keep in mind pigs tend to eat litter materials, so the most natural litter material you can get, the better. Know that pigs sometimes have accidents. Confining them to a smaller space can help reinforce potty training techniques. The salt in itself isn’t the problem; it’s the lack of water at the time the salt is consumed that is the problem. Salt toxicity occurs when there isn’t fresh water available after a substance high in sodium is consumed. When fresh water is made available, they tend to drink massive amounts that cause neurological problems and this can kill your pig. Wood shavings can be used for melting ice, or cat litter can be used. While we do not want our pigs eating these things either, they’re a little safer than rock salt. The salt can also be irritating to their hooves. Antifreeze has a sweet taste (according to experts, I have not personally tried it) and is enticing to animals in general. Antifreeze can be deadly if ingested, so be sure you do not have any radiator leaks on any cars that may be parked in the same area your pig roots around in or no containers of antifreeze left around the yard that your pig can possibly get in to. If your pig does sustain a fall and is limping, call your vet. They will probably need to do an assessment and possibly an X-ray to determine the extent of the injuries. 8. Determine how to quickly warm your pig up if your pig gets too cold. Towels and blankets can help keep your pig warm as can pig sweaters or DIY pig clothes. You can take a fleece blanket and use ribbon to wrap around your pig to keep the blanket in place while your pig goes outside. Do NOT use space heaters for pigs, they tend to get too close and will get burned requiring emergency visits to the animal hospital or emergency vet visits. 9. With Christmas literally around the corner, these are things to be on the lookout for. Tinsel- its shiny and usually all over the place. Pigs like shiny objects and love shredding stuff, so tinsel is a “treat”, so your pig thinks. If you insist on using tinsel on your tree or around your home, please put it in places your pig cannot reach. Consumption of one piece likely wont hurt anything, but a mouth full can certainly lead to choking or bowel obstructions. Most likely it will pass through the GI system without any issue, but its better to be safe than sorry. Gifts- your pig thinks every gift ever made is for them. Your presents under the tree are no exception, especially the ones with something scented inside. They will likely be targeted first. Wait to put gifts out until they’re ready to be opened or know that your pig WILL likely unwrap and eat whatever is inside if given the opportunity. Poinsettias/Mistletoe/Holly- Mistletoe and Holly are more poisonous than poinsettias, but the amount ingested and the size of your pig are what determines if any medical treatment is needed. If your pig eats some of any of those plants, know how much your pig weighs and also how much was ingested. It may not ne quite the emergency you think it is. Nuts- Anything other than unsalted peanuts should NOT be given in a shell. Many pigs have died because they ate hard shell nuts with the shell intact. They cannot process these shells. The shells will actually cut up their esophagus, stomachs or intestines and this will kill your pig. Do NOT give your pig nuts in a shell. Tree preservatives/tree water- Some people choose to have a live tree and have to add ingredients to the water to sustain the life of the tree. Some of these ingredients can upset the belly of your pig should they drink any of that water. Just be cautious about what you’re using and whether or not your pig has access to it. Homemade play dough/ornaments- These are made using a lot of sodium rich substances, if your pig eats this, your pig is running the risk of developing salt toxicity as discussed earlier plus dangerous electrolyte imbalances. Keep these kinds of items out of your pigs reach. Bones of any kind- Do NOT give your pig bones. They are not dogs and if you chose to eat meat during the holiday season, do not give it to your pig. We are well aware pigs in the wild consume nuts and meat, but your pig is not a wild pig and their body’s have adapted to a more domesticated lifestyle. Bones in general are much like nuts and can splinter causing hemorrhages internally leading to your pig’s untimely death. Alcohol- Pigs can be mean drunks. They can also suffer from acute alcohol poisoning. Giving your pig alcohol purely for your amusement isn’t fun or funny. We do not recommend giving pigs’ beer or wine or liquor of any kind. Children’s small toys- This becomes a chewing/swallowing hazard. A pig will attempt to eat a Lego or plastic toy, sometimes succeeding. If they’re able to get the toy through the esophagus, they still have to get it past the gut and through the intestines. Because toys are made from all sorts of things, these smaller toys can break apart leaving dangerous edges that can cause internal bleeding, they can be small enough to swallow but too big to pass through the intestines causing an obstruction. Keep these things off the floor. Snow Globes- Some snow globes contain ethylene glycol, a highly toxic substance to all pets. If a snow globe is broken, either by a person or a pet, the sweet smell can attract a pet to lick it up, leading to a potentially fatal intoxication. Snow globes should be kept out of reach of pets. Don’t spend so much time worrying about things that you forget to enjoy your holiday! Pigs will be pigs, but if you use these suggestions, your holiday can be a bit brighter!! Interstate and international travel regulations require any pet you bring with you to have a health certificate from your veterinarian – even if you are traveling by car. Learn the requirements for any states you will visit or pass through, and schedule an appointment with your veterinarian to get the needed certificate within the timeframes required by those states. Even Santa's reindeer need to get health certificates for their annual flight around the world. Pigs in vehicles should always be safely restrained and should never be left alone in the car in any weather. Proper restraint means using a secure harness or a carrier/crate, placed in a location clear of airbags. Never transport your pet in the bed of a truck. If you’re traveling by air and considering bringing your pet with you, talk with your veterinarian first. Air travel can put some pets at risk, especially older pigs. Your veterinarian is the best person to advise you regarding your own pet’s ability to travel. If your pig is not an emotional support pet, your pig will need to travel in the cargo section of the plane and not with you in the cabin. This is not recommended or ideal, if possible. Pigs have a very small lung capacity under normal circumstances, so any additional pressure on your pigs already "not so great" lungs may hurt your pig. Boarding your pig while you travel? Talk with your veterinarian to find out how best to protect your pig from contagious diseases, and to make sure your pet is up-to-date on vaccines. There are boarding facilities and other pig parents and pet sitters that may be able to lend a helping hand when you are going to be away for a short amount of time. Having someone come to YOUR home is usually easiest on your pig though if boarding at a reputable place isn't an option. Some pigs cannot handle travel because of illness, injury, age or temperament. If your pig is not good with travel, you should consider a reliable pet-sitter or talk to your veterinarian about boarding facilities in your area. Keep in mind that pigs don't accept change well and you will likely need to find someone who knows your pig well. Even by doing that, your pig may still act aggressively to your sitter, so arm yourself with a hog panel or sorting board so your pig sitter isn't at risk for getting hurt. Videotape a day in your life so your pig has little change in their care, if possible. Make sure your pet has identification tags with up-to-date information. A harness has a place where tags can easily be placed. Having your pig implanted with a microchip can improve your chances of getting your pig back if it becomes lost. The microchip must be registered with your current contact information, including a cell phone number. A tag is included when you have a microchip that has the microchip number and a mobile contact of the owner, so if the pet is found, they can use the tag to determine ownership without having to contact a veterinarian. Contact the microchip company for a replacement tag if you've lost yours, and for information on how to update your personal information when traveling. If you are looking for someone that can "pig-sit", click here to see the list we have compiled of people willing to help. Make sure that your pet is allowed where you are staying. Some accommodations will allow pets and some will not, so check in advance. Also, when traveling, you should bring a portable kennel with you if you have to leave your pet unattended. Click here to see our list of places that DO allow pets, you will need to call and verify pigs are allowed. Staying in a Hotel or Motel: Stay at a pet friendly place. Some hotels and motels only accept small pets or pets under a certain weight; when making a reservation, make sure you inquire about the terms of their pet policy. Try to minimize the amount of time your pet will be alone in the room. When leaving your pet alone in the room, inform the front desk that your pet is being left alone in the room and place a "Do Not Disturb" sign on the door. Make sure the hotel/motel knows how they can contact you if there are any problems. Staying at a Park, Campground or Marina: Make sure these places are pet friendly, clean up after your pet and always keep your pet on a harness/leash. There are lots of families who bring the family dog to these types of places, be sure to keep your pig safe from predator animals (dogs) by ALWAYS keeping your pig secure or on a harness and leash.